01x 195 litre solar complete tank. 01x Powder coated adjustable angle stainless steel frame. 01x European made digital controller. 01x Roof fixing kit includes stainless steel coach screws and rubber flashings. Auto air vent one way valve. 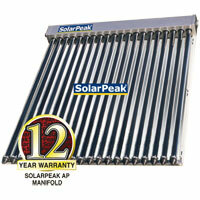 01x 300 litre solar complete tank. 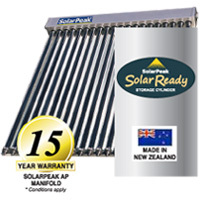 This quality solar system includes only the best components designed for New Zealand conditions, including stainless steel fixings for coastal environs, high winds and earthquakes. 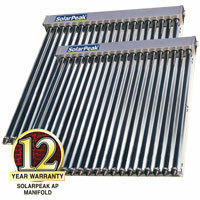 The kit comes ready to install by our nationwide team of certified solar practitioners. 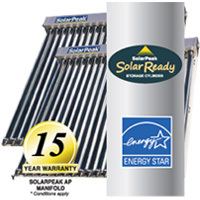 A SolarPeak system is accpted as the best available by most Architects and Councils in New Zealand. 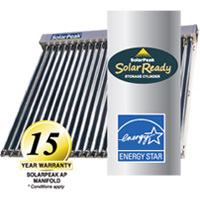 An ENERGY STAR qualified system will typically save around 65% of the annual water heating costs compared to a traditional electric water heater, is backed by extensive warranties, and meets the latest New Zealand water heating standards for design and construction. We have installers in most areas of New Zealand. Make an enquiry / Place an order. or contact us by phone: Phone Glenn Harvey today to discuss on 0508 468 928 37 or mobile 027 318 9534 or see the contacts page to find your nearest installer.